Some General Rules: (1) You are in a serious and significant relationship where one of you is/was an Active Duty Army male (including activated Army Reserve or National Guard) and one of you is a civilian female. (2) The male has recently returned from a deployment to Iraq or Afghanistan. (3) This serious and significant relationship has lasted at least one year in duration AND you were together BEFORE the male left for his last deployment. 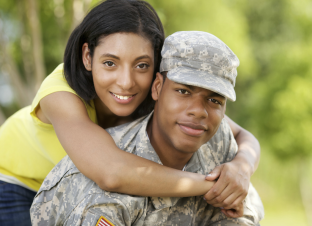 "The Relationship Studies Lab from the University of Colorado Denver is working on a study of military couples. This study is important as it is designed to help us better understand some specific post deployment challenges military couples face with the goal to inform services and programs designed to help military families. This research project is approved and funded by the Department of Defense. Although we are funded by the DoD, we are civilian researchers. We keep participation and all responses confidential, but provide summary findings to the DoD so that our results go back to the folks that really need to hear it. We are looking for couples where he is/was in the Army (including Army Reserves and Army National Guard) and has a history of recent deployment, and she is a civilian. They can be married or in a serious long term relationship. Couples who participate would take an online survey with the possibility of being invited to take more surveys in the future. All couples need to do is go to www.armycouples.com to learn more and sign up. If the couple is selected for the survey, each individual is compensated with a $50 gift card (so $100 for the couple) for doing the first survey. If the couple completes later surveys, each person would earn a $75 gift card per survey (so $150 for the couple per survey)". Looking for Veterans Day Deals, check out our post!